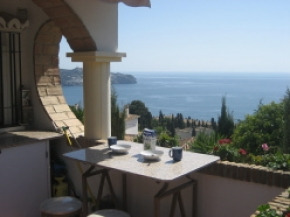 La Herradura Villa rental: Casa Perry a stunning 3 bedroom villa in La Herradura Costa Tropical. 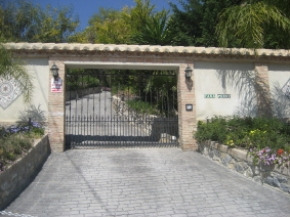 Casa Perry is a stunning 3 bedroom villa, with mature gardens, private pool and additional pool side kitchen/bar/games room. 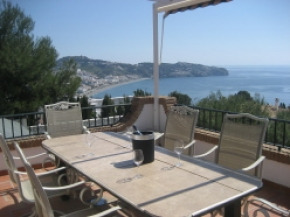 Its located to the west of the bay with fabulous views, just 20 minutes walk down or a couple of minutes drive into La Herradura, where you will find lots of restaurants, tapas bars and small shops. The property is approached from below, and has an external car port with steps leading upto the property or a sweeping driveway leads up to an additional car port. There is a large roof terrace above the garage and mature gardens with fruit trees. Outside you find a large pool with external shower room with WC, dining table, chairs, and ample reclining loungers to soak up the sun. 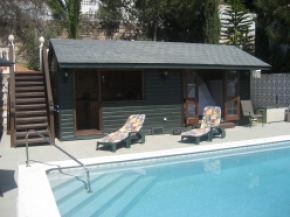 There is an outside cabin with kitchen/bar area equipped with mini grill, fridge, music centre and plastic pool side utensils to the left and a room with double sofa bed on the other side. The main property can be accessed here, a large hallway leads to all the bedrooms and a family bathroom. 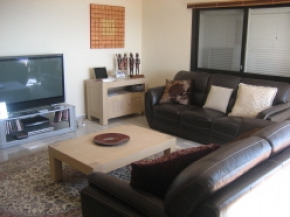 The master double bedroom with seaviews has an ensuite bathroom with shower attachment, there is a flat screen TV with SKY available, and a door leads out to poolside. 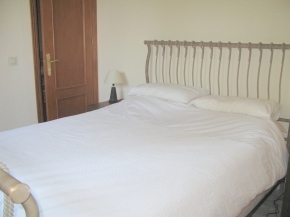 The second twin bedroom has sea views, TV with sky and a door leading to poolside. 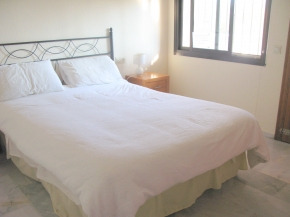 The third double bedroom has an ensuite shower-room, sea views, and flat screen TV with separate SKY box. Upstairs you will find another large hallway, from here you can access a large living room, beautifully furnished with coal fire, leather sofa's, large flat screen TV, SKY and DVD. The kitchen/diner can be accessed from the hallway or living room. 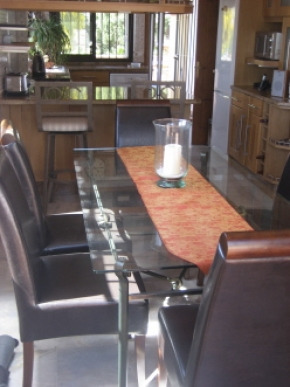 The dining table can seat 6 comfortably and there are additional seats at the breakfast bar. The kitchen is large and well equipped with double oven and hob, microwave, fridge/freezer, electric juicer, sandwich maker and music centre etc. A doorway leads onto a smaller terrace with washing machine and a lovely breakfast bar with seating to enjoy the sun rise. From the kichen/diner and the living room are doorways leading to a large terrace with dining table and chairs, the terrace can be covered with awnings. The views from here are stunning over the bay, and the pool can be accessed from this terrace via external steps. 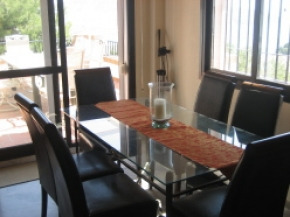 Throughout the villa is aircon/heating and ceiling fans. There is a safe, alarm, iron, hairdryer and beach towels are provided.